This is a photo of Miles when he was about 12 weeks old. We lived in this house just off campus that we thought was really cool at the time, but now would probably think was just really old and kind of gross. Anyway, these stairs led from the kitchen up to the bedrooms on the second floor, and they were really steep and slippery. Miles was scared to death to climb them, so for the first couple weeks, we carried him upstairs with us. But, if he got left downstairs by accident, he would sit at the bottom and whine. Whining is something he is remarkably good at. 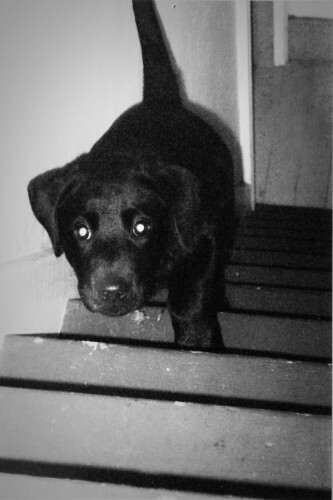 I snapped this shot the very first time he learned to climb those stairs. The look on his face is his signature, “I am really annoyed with you, and you should treat me better” look. This was back in 2000 before I ever owned a digital camera, and it’s one of the only photos I have of him as a true puppy. He was a demonic challenging youngster, as my parents, siblings, best-friend, cousins, roommates, ex-boyfriends, etc. can all attest. When I was interviewing at IBM, the interviewer took me to the park along Lake Champlain and we talked about our black labs. That was maybe a couple weeks after I took this photo, and I asked him when they settle down. He said around five years old, and I remember wondering if either Miles or I would make it through another four years alive. That settling down never really happened, though he moves a little bit slower now, and the day after an afternoon spent swimming seems a little rough on him. Miles has been around for almost eleven years now…through cross country moves (he’s lived in six states), loss, joy, everything. He’s my buddy, always there for snuggles and comfort, always crazy to go on a walk or a car ride (I mean crazy). He’s one of the few dogs I’ve ever met that loves a true hug…he leans into you and tucks his head down and paws at you when you let go. He can still drive me absolutely ballistic just about every single day, but I don’t know what I’ll do without him, and I’m glad he’s still here and still crazy. And, I hope he stays that way for at least a few more years to come.